There’s a supermassive black hole at the center of every galaxy. An extra-souped-up supermassive black hole’s called an Active Galactic Nucleus, or AGN. The energy radiating from an AGN is so intense it accelerates subatomic particles and magnetic fields to nearly the speed of light. Cosmologists don’t understand exactly how this happens. 3C 348, aka Hercules A, pictured here, is a giant elliptical AGN galaxy in a galaxy cluster a couple billion light years away in the constellation Hercules (it’s the hazy object in the middle of the shot). Hercules A’s AGN weighs in at about four billion times our own sun’s solar mass, making it roughly a thousand times more powerful than the supermassive black hole at the center of our Milky Way, Sagittarius A. 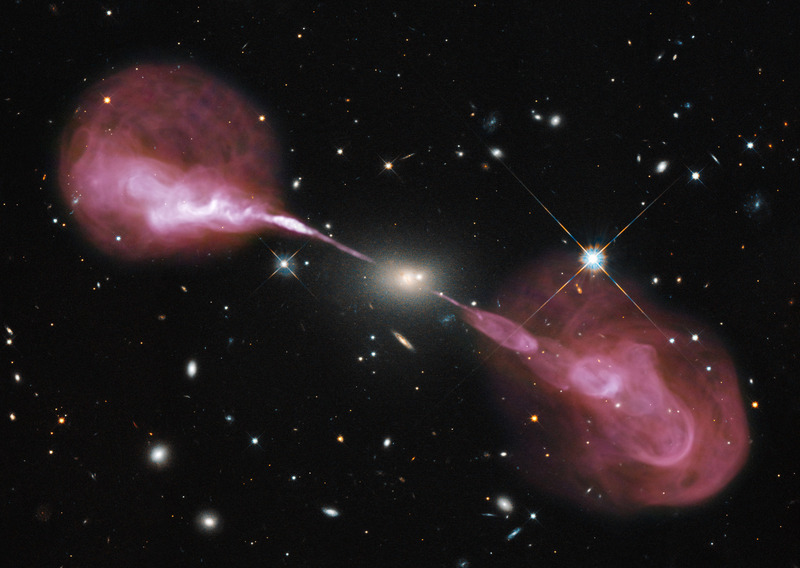 The galaxy looks much like any other elliptical galaxy in visible light, but when imaged at radio frequencies, the two spectacular over-a-million-and-a-half-light-years-long plasma jets in the image above are revealed. Part of Hercules A’s intensity may derive from a second galaxy and its black hole that the AGN’s swept up and is in the process of devouring. (Galaxy mashups are fairly common — see my post on colliding galaxies here). As a fresh generation of space telescopes is trained on AGNs, expect the mysteries about what’s going in inside them to deepen.